Currently I am using mIRC 6.35. When I authorize someone for dcc automatically it does not work. Is there a fix for that? Short answer: I'm unaware of any known issues with authorization, and presumably unaware of any fixes for it. I've known DCC as one of those things where everything has to be right for anything to work. 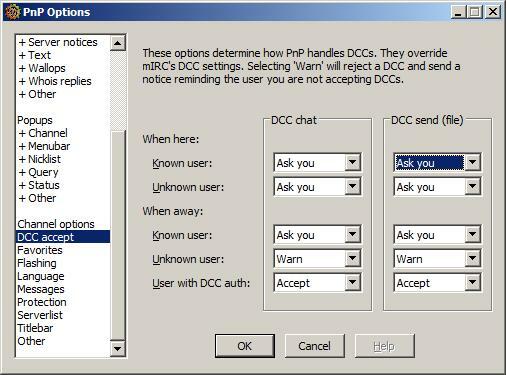 In this case, I'm not sure if it's the authorization or DCC itself that misbehave. When doing my own limited testing, I get an "Ignored DCC" message for those without authorization while a DCC window opens normally for those authorized. In other words, somewhat unable to reproduce any issues with it as far as Peace & Protection goes. - DCC ports not forwarded from gateway/router/modem to client machine in local network. Any details would be helpful in determining what's malfunctioning and how to make it work. Nothing happens whatsoever? Error messages? Other symptoms used to determine it's not working? Steps taken to get there? It won't accept the dcc from the authorized user. 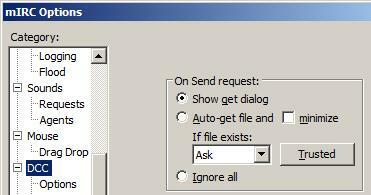 I have to manually accept it and then it will send the file. No errors or anything. It just doesn't work at all. I reinstalled both mIRC and PNP and the dcc authorization worked for a while but now it has quit working again. I have all the settings set correctly.